The Erdvark Extra Heavy Duty SKSH11 is ideal for making new lands in virgin soil with stumps and other obstacles. The robust disc gang construction with two spacers between Erdvark bearing units are fitted on each disc gang axle. 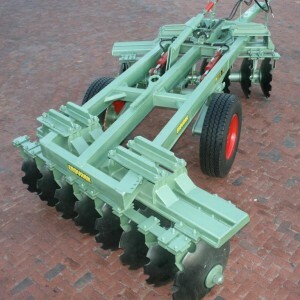 The disc spacing of 11″ (280 mm) is ideal for cultivation of all soil types with a weight of 125 – 140 kg per disc. 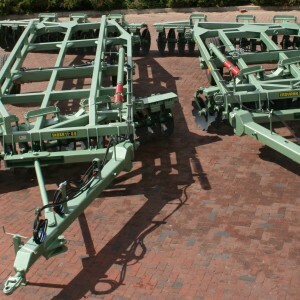 The SKSH11 Offset Disc Harrow is ideal to do heavy duty applications as well normal seedbed preparations. 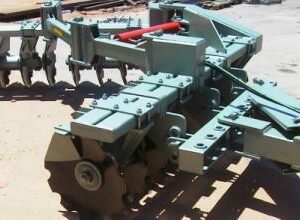 The SKDH11 Extra Heavy Duty Double Offset for making new lands in virgin soil with stumps and other obstacles. This unique Offset Disc is suitable for uneven terrain and hilly conditions, disc spacing 11″ (280 mm) and 26″ or 28″ discs with independent depth control. The robust disc gang construction with two spacers between Erdvark bearing units are fitted on each disc gang axle and weight off 125 to 140 kg per disc. The Erdvark SKDH11 model can be used as one big unit or two separate Offsets. The Erdvark SKSXH11 extra heavy duty Offset is ideal for making new lands in virgin soil with stumps and other obstacles. The robust disc gang construction with one spacer between Erdvark bearing units are fitted with 11″ (280 mm) spacing. The SKSXH11 offset is ideal for the cultivation of all soil types and conditions with a weight of 140 to 170 kg per disc. 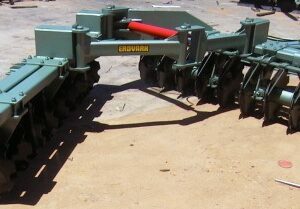 The Erdvark SKDXH11 Extra Heavy Duty Offset for making new lands in virgin soil with stumps and other obstacles. The SKDXH11 Offset Disc is suitable for uneven terrain and hilly conditions with a disc spacing of 11″ (280 mm) and 26″ (660 mm) or 28″ (710 mm) discs and give a weight of 140 to 170 kg per disc. The disc gang are fitted with only one spacer between each Heavy Duty Erdvark bearing unit. The SKDXH11 model can be used as one big unit or two separate Offsets. The Erdvark HKS 14 Extreme Cut Hinge type Offset Disc is ideal for land clearing, to uplift soil, cut roots and cut left over vegetation. The robust Offset Disc can cut up to a depth of 280 mm to 300 mm and can handle stumps and rocky conditions. The HKS 14 are fitted with the maintenance free heavy duty Erdvark bearings with high tensile disc axle of 55 mm diameter and 32″ (812 mm) notched discs. Ideal Offset for Crawlers and Tractors. The Erdvark BKS14 Extreme Cut Offset for first cut land clearing, to uplift soil, cut roots and cut left over vegetation. This Offset is fitted with 32″ (810 mm) discs. The BKS 14 Extreme Cut Offset cutting depth is 280 mm to 300 mm and this robust Offset can handle stumps and rocky conditions. This Offset are fitted with the Erdvark heavy duty maintenance free bearings and high tensile disc axle of 55 mm. The Erdvark HWR Trailed Hinge-Wheel Offset on the go cutting angle adjustment to control optimum cutting depth. The HWR Offset is ideal for first cut after land clearing, to uplift soil, cut roots and left over vegetation. 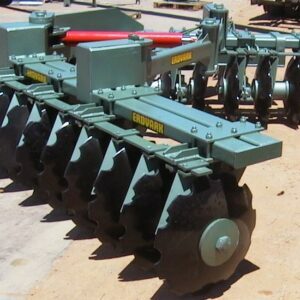 The cutting depth is up to 320 mm and can handle stumps and rocky conditions. 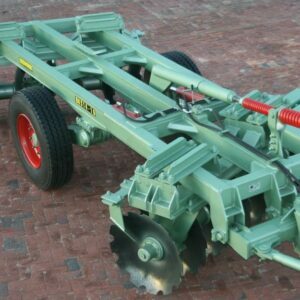 The Offset is fitted with 36″ (910 mm x 12 mm) notched discs and the Erdvark heavy duty maintenance free bearings with high tensile disc axle of 65 mm in diameter and can be fitted with 16″(410 mm), 18″(460 mm) or 20″(510 mm) disc spacing. The Erdvark HKR Trailed Hinge type on the go cutting angle adjustment to control optimum cutting depth and is ideal for first cut after land clearing, to uplift soil, cut roots and left over vegetation. 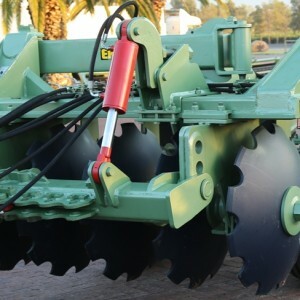 The cutting depth of the HKR is up to 320 mm and can handle stumps and rocky conditions. 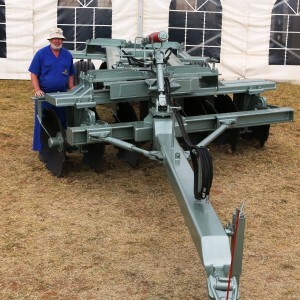 The disc harrow is fitted with 36″ (910 mm x 12 mm) notched discs and the Erdvark heavy duty bearings with high tensile disc axle of 65 mm in diameter and available 16″(410 mm), 18″(460 mm) and 20″(510 mm) disc spacing. The Erdvark BKR Extreme Duty Offset Disc is ideal for first cut after land clearing, to uplift soil, cut root and cut left over vegetation. The cutting depth of the BKR is up to 320 mm and can handle stumps and rocky conditions. The BKR Disc is fitted with 36″ (910 mm x 12 mm) notched discs and the Erdvark heavy duty bearings with high tensile disc axle of 65 mm in diameter and is available in 16″(410 mm), 18″(460 mm) and 20″(510 mm) disc spacing. The Erdvark BKSH14 Extreme Duty Offset Disc for first cut land clearing, to uplift soil, cut roots and cut left over vegetation. 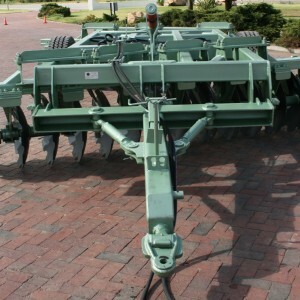 This Trailed Offset is fitted with 32″ (810 mm) discs. The BKSH14 cutting depth is up to 280 mm to 300 mm and this robust Offset can handle stumps and rocky conditions. The BKSH14 Disc Harrow is fitted with additional Erdvark heavy duty maintenance bearings with high tensile disc axle of 55 mm in diameter to handle all tuff conditions. The Erdvark HKSH14 Extreme Duty Hinge type Offset Disc is ideal for land clearing, to uplift soil, cut roots and cut left over vegetation. The robust Offset Disc can cut up to a depth of 280 mm to 300 mm and can handle stumps and rocky conditions and is also ideal for working with crawlers. The HKSH14 are fitted with additional extra heavy duty maintenance free Erdvark bearings with high tensile disc axle of 55 mm diameter with 32″ (812 mm) notched discs and 14″ (356 mm) disc spacing. The Erdvark BKS12 & BKSH12 Extreme Duty Offset Disc for first cut land clearing, to uplift soil, cut roots and cut leftover vegetation. The BKS12 & BKSH12 Offsets are used in road building construction. 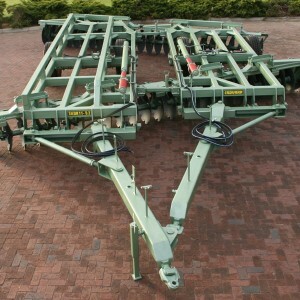 This Trailed Offset is fitted with 32″ (810 mm) discs. The BKS12 & BKSH12 cutting depth is up to 280 mm to 300 mm and this robust Offset can handle stumps and rocky conditions. The cutting width per disc is 305mm (12″). 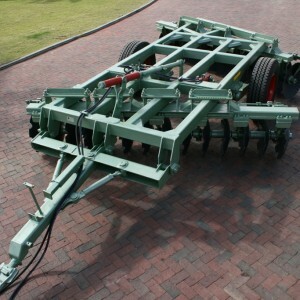 BKSH12 Disc Harrow is fitted with additional Erdvark heavy duty maintenance bearing. Both these Offsets are fitted with high tensile disc axles of 55 mm in diameter to handle all tuff conditions.